Perception has the extreme misfortune of beginning its second season less than a week after Hannibal finished its first. There are crucial differences between the shows (mostly in the scope of their respective ambitions, though that’s debatable), but given Perception’s stated interest in mental illness and “dark procedural” trappings, the comparison is instructive. Where Hannibal is the product of a singular, compelling artistic vision, Perception is basically a mashup of every other “quirky investigator” procedural ever made, a show that continually appears to be made by committee. Where Hugh Dancy’s Will Graham is a haunted man both gifted and cursed with a cocktail of psychologically disorders that actually do make him a uniquely gifted man hunter, Eric McCormack’s schizophrenic FBI consultant Daniel Pierce looks and sounds like he was created by a Netflix-style algorithm cobbling together everyone from Dr. House to Temperance Brennan to Adrian Monk. Obviously, Perception is a different sort of show, but where Hannibal distinguishes itself as a stunning, successful version of the serial killer show, Perception is just middling. The frustrating adequateness of Perception comes primarily from a sense that the show doesn’t quite know what it wants to be. Tonight’s premiere and especially next week’s second episode veer from wholeheartedly embracing the USA-ness of the premise to try to seriously examine the consequences of Daniel’s mental illness in a way that makes it very difficult to sustain any sort of reaction. This sort of tonal whiplash is particularly disappointing considering the way the end of the first season came close to the mark for both versions of the show: An admittedly ridiculous political conspiracy plot put Daniel in the hospital and produced the sort of claustrophobic distrust it’s easy to imagine someone with Daniel’s schizophrenia and hallucinations actually experiencing. Meanwhile the finale’s end set up a new status quo where Daniel was contained by his meds and had real intimate relationships, both with his former student and FBI agent Kate Moretti (Rachel Leigh Cook) and with Caroline Newsome (Kelly Rowan), the real-life basis for his imaginary friend Natalie (The show got weird, okay?). In its attempt to get back to basics, these first two episodes decide to ignore those developments entirely. In a premiere maddeningly titled “Ch-Ch-Changes,” Daniel goes off his meds after almost a year with the barest of explanations and immediately begins lying about it, both to Caroline (with whom he appears to have something resembling a romantic relationship) and to Kate (to whom he promised in the first season finale he would not lie about his meds and his hallucinations), again with literally no explanation other than “Ha, misunderstandings!” It’s too bad McCormack has to try to sell this, because he’s still more than serviceable at playing this type of character—he’s simply being asked to do too much and not given a lot of motivation other than his schizophrenia as a catchall explanation for everything he does, particularly when he has to play it as both a source of lighthearted comedy (when he sees one of his hallucinations beam, Star Trek style) and a debilitating disorder. 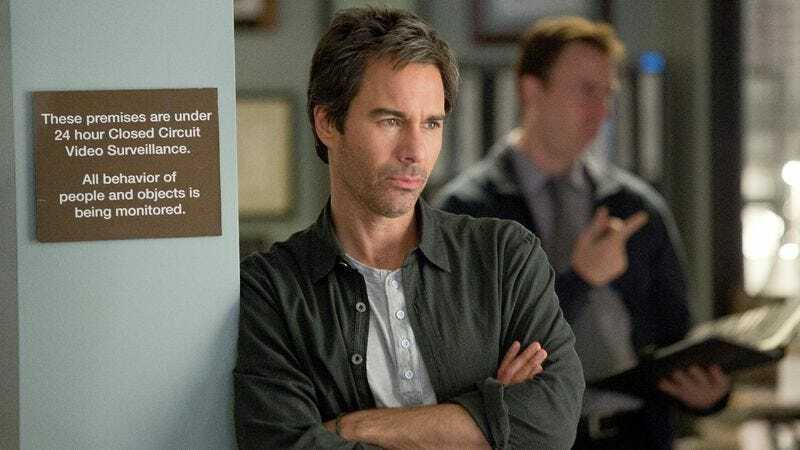 The show’s focus on mental illness, while tricky for Daniel, is a big strength for the cases of the week in the first two installments of the season. In the premiere episode (which has a substantially better case), convicted murderer Billy Flynn (Evan Jones) has sustained a brain injury comparable to the famous case of Phineas Gage, who underwent radical personality change after getting a frontal lobotomy from a railroad spike through his head. Reversing the dynamic of the prototypical House story, Daniel creates a serious problem for philosophers by idealistically arguing that Flynn is essentially a new person deserving of a clean moral slate. The second episode, “Alienation,” finds a woman suffering from a disorder that functionally turns victims into characters in Invasion Of The Body Snatchers, convinced their loved ones are imposters. Though the Invasion Of The Body Snatchers conceit serves mostly to get Daniel to a ComicCon-style environment, the case maintains a loose thematic concern with how, exactly, we know other people are who we think they are (or who they say they are). Otherwise, Perception’s quirky procedural elements are par for the course. A few of the offbeat supporting characters are fun, especially Levar Burton’s criminally underused dean and Arjay Smith’s put-upon, nerdy assistant. Others are and remain flat—in particular, it’s easy to see why newcomer attorney Donnie Ryan (Scott Wolf), Kate’s soon to be ex-husband, makes sense as a source of tension, but the character doesn’t really cohere in tonight’s episodes. For every reasonably enjoyable turn in the cases or attempt at fun, there’s a particularly awkward line of dialogue or a jarring shift in pacing, particularly as the show tries to go from where the characters were at the end of the first season to functionally the status quo at the end of the pilot in a period that seems like maybe two weeks. Those rapid changes are particularly frustrating in the relationship between Daniel and Caroline, which comes this close to using Pierce’s own schizophrenia for interesting purposes. At risk of spoilers: The end of “Ch-Ch-Changes” sets up what seems like an interesting dynamic of Daniel carrying on a hallucinatory relationship with Natalie and a real one with Caroline while never quite being sure which is which, while “Alienation” cruelly pulls the plug on Daniel and Caroline, sending Daniel back to square one. I hope Caroline comes back, but it’s hard to say if that will happen. Like the shows it copies, the name of the game in Perception’s second season is effectively maintaining the semblance of change. Keeping the shells moving fast enough to hide that is likely to be Perception’s biggest obstacle as it tries to differentiate itself from the shows with which it shares 99% of its DNA. In particular, even as Perception engages in consistent procedural cliché, it still hasn’t established its relationship to the genre. By now, many series in the “quirky investigator” subgenre of procedurals are more enjoyable the less seriously they take themselves: When the writers seem aware of the deeply formulaic nature of the series they’re working on (Psych, early Burn Notice), the action hits the right breezy but mildly engaging tone, and when they’re not (late-period House), everything becomes stagnant and self-serious. At the beginning of its second season, Perception isn’t walking the line between those two extremes—it’s drunkenly stumbling across it.